Using an image for your whole email signature is not only a bad idea, but it could also be hurting your business and brand. Before making your email signature in Photoshop and just using the image as your email signature, keep reading. You’ll be glad you did. There are quite a few reasons why using an image as your email signature is considered bad practice and should be avoided at all costs. The point of email signatures is to allow your recipients to contact you easily, right? When you send someone an email with a signature that is just a large image, you’re doing the opposite. They won’t be able to click on your phone number (click-to-call) to call you instantly or click on your website, social icons, email address etc. Similar to above, let’s say the recipient wants to send your details to their friend to give you referral business. Well, they can’t copy and paste the information because it’s not text, it’s an image. You’ve possibly just lost some referral business. You hire a new employee, and they need a new signature. However, before they can get an email signature, you must get someone who is an expert in Photoshop to create their signature for them. A few hours later, and its done. It shouldn’t take that long, and it’s easy to make mistakes doing it this way. That’s why its not a scalable solution. For an email signature solution to work properly, consistency is key. If you have 10 employee’s and 5 different looking email signature layouts, it’s not going to look good to your recipients. 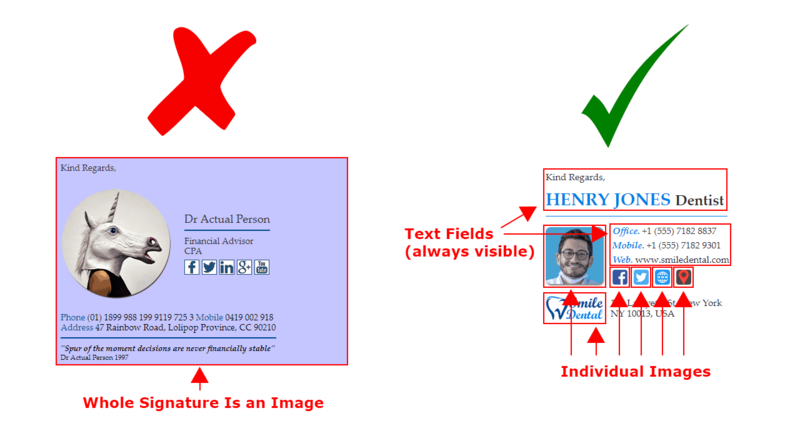 Creating each individual email signature using an image is bound to cause inconsistencies across your team. Most email clients have security precautions when downloading images. Meaning, they will ask if you would like to download the images in your email message, and it won’t happen automatically. So, if your recipient doesn’t download the images (which they likely won’t since the default behavior is to not download), they won’t see your whole email signature. No name, phone numbers, website or any other contact details. Let’s say you’ve changed your phone number, or address and you want to change your email signature. Firstly, you will need to remember where you saved the Photoshop file, or if you even have it. If you don’t have it, then you have to create the signature again from scratch, and that will take hours. Images use a lot more hard disk space than text. With that being said, your mail servers are likely going to increase in size dramatically by storing thousands of these large images every time you send an email. Also, you will be filling up the disk space on your recipient’s mail servers too, and they probably won’t like that. Let’s say you want to change the font or add a banner at the bottom of all the email signatures for your whole team. 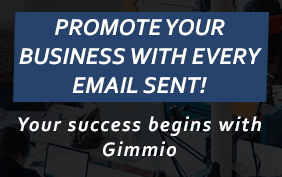 You’re going to have to edit every single image file, add the banner and make it look consistent with all the other signatures, and then get your staff to re-install the email signatures again. How can I create an email signature that works? We’ve been around for years and we’ve seen all the mistakes that people make when creating email signatures. One of the best ways to create a professional email signature is to use a good email signature generator that is compatible with all the popular email clients and has many great looking templates.